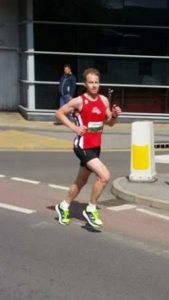 Sunday 14th May brought Jackpot’s Tom Van Rossum in action in the Leeds Half Marathon. Here’s Tom Race report. “Having never done a half marathon without a swim/bike warm up, I accepted the offer of an entry to Leeds half marathon on Saturday afternoon. After my ritual pre race feed of Pad Thai, I rocked up on Sunday morning in the place of Sarah (green pen, predicted 2h30 finish time). Targeting a slightly faster pace than Sarah, I wished Bron good luck on her race, and squeezed myself in between the more serious runners in the blue pen, hiding the coveted green bib from the vigilant pen guards! My race plan was to go sub 1h20. Some pre race calculations showed that 3.45 min km’s would bring me in at 1h19 and change (mindful that I may need the extra seconds for the inevitable explosion of my legs as I hadn’t done any long intervals or prep for a half marathon). The gun went and I settled in with a small group, as the leaders shot out of sight. The first few Km’s ticked by and sub 3.40 felt comfortable. Having a chat with the guy I was running with, he mentioned he was aiming for for 1h15. “Too fast for me” I thought, but I stuck with him as we reeled in the stragglers from the fast starting lead group heading up through Meanwood. I ticked off the first 10km averaging 3.40 min km’s. Arriving at the ring road at the half way point, I figured that was the hard bit done and it was all downhill from there. Heart rate was above threshold with another 10k to go and moving at pace was an increasing struggle. I also really needed a pee by this point. Contemplating the spectators reaction to me peeing my pants, I relented and hoped the finish would arrive a little bit sooner. At the next aid station I grabbed a gel and washed it down with the 2 pro plus stashed in my pants. Probably a good reason for not having that pee I needed earlier. The sub 1h15 dude was long gone by this point and I was now becoming the stalked, and not the stalker. Down on to Kirkstall Road for the last leg home and the double burst of carb and caffeine kicked in. Ticking along towards the finish in town, I knew the final hurdle would be the small rise (but feels like a mountain) over the ring road to reach the finish. I was wrong. Note to self, check the position of the finish line prior to the race. It turned into the longest finish sprint following the numerous turns around the town hall. Knowing that I was well under 1h20 pace I didn’t really care about my time at this point, I just wanted to finish. With the line in sight (but at the top of another hill) I was doing the worst impression of sprinting and finished in 1h17.50. Sarah was 18th overall, 1st female by over 3 minutes and scored a huge PB. Aiding my recovery with the well received post race beer, I waited on for Bron to finish her race towards a PB. With the clock ticking towards her target time of 1h45 it was going to be close. Executing a far better example of pacing than myself, she crossed the line 10 seconds shy of her target, smashing a new PB in 1h44.50! That’s how to pace a race”! 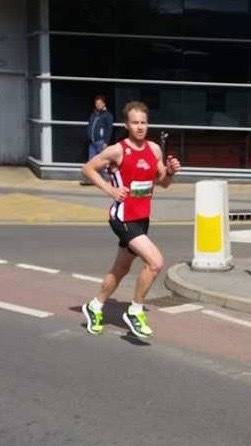 Also in action in the Leeds half Marathon was Rich Knell-Moore. In response to his race, Rich said “What’s there to say about a half marathon!”. Rich let his feet do the talking and and finished with a time of 126:31. Welldone to Tom and Rich with strong running and two PBs.